The Pillsbury Family lineage is extensive. 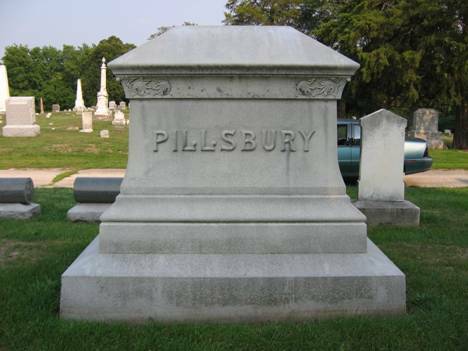 The Pillsbury family heritage starts in England in a town named Pillsbury. According to The Pillsbury Family they were from, “A valley of Dove, on boundary between Derbyshire and Staffordshire, 150 miles north from London, 30-40 miles southeast of Liverpool.” The first Pillsbury to come to America was William circa 1640. Little did he know that over 200 years later his great, great, great, grandson would be the founder of a city in Henry County, Illinois, and that a generation beyond him would consist of a Mayor from the small town of Monmouth, Illinois. 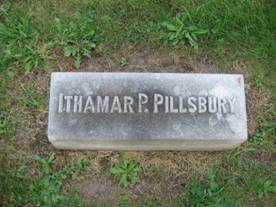 Ithamar P. Pillsbury was born on Feb. 22nd 1827 in Parishville, St. Lawrence County, New York, the son of Caleb Pillsbury and Anna Underhill. Of his eight brothers and sisters, he is the second youngest. Ithamar came to Illinois with his parents in 1836. His uncle, Ithamar P. Pillsbury, for whom he is named, was the founder of Andover Colony in Henry County. (See Appendix 1) There is much about Ithamar’s early childhood that is not known. However, it is known that he was into business. He worked in Peoria, Illinois for a few years conducting business deals, but to what extent and with who is unknown. Early in his life, Ithamar ventured east to New Hampshire where he seems to have had family ties. 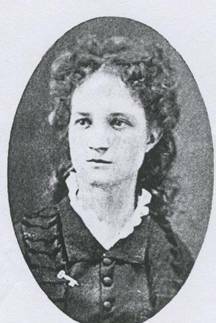 On September 7, 1853, he married Louise M. Pattee, in Canaan, New Hampshire, her hometown. Louise Maria Pattee, born on April 26, 1829, was the daughter of David Pattee and Judith Burley. 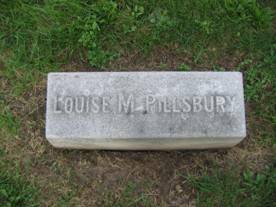 The couple moved back to Illinois, where on Oct 14 of the next year, their first daughter, Alice Louise Pillsbury, was born in Peoria. The young newlywed parents then moved to Monmouth in 1855. 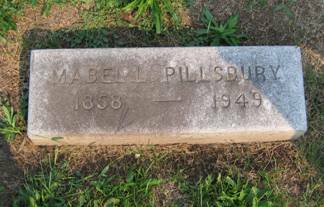 Ithamar and Louise welcomed their second daughter, Mabel Lillie Pillsbury, into the world January 16, 1858. 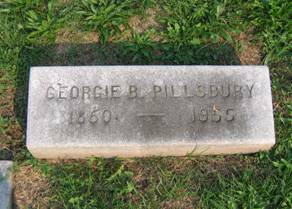 There is not much that is known about the family in this time except that on June 24, 1860, the family again expanded to include Ithamar’s third and final child, Georgie Burder Pillsbury. It was in this time that he decided to buy a brand new house. His oldest daughter, Alice, had married Frank Shelby on October 14, 1884 and moved to London Mills. Ithamar set his sights on Broadway, which was the main street in the town, because that is where the most prominent houses of the time were being built. 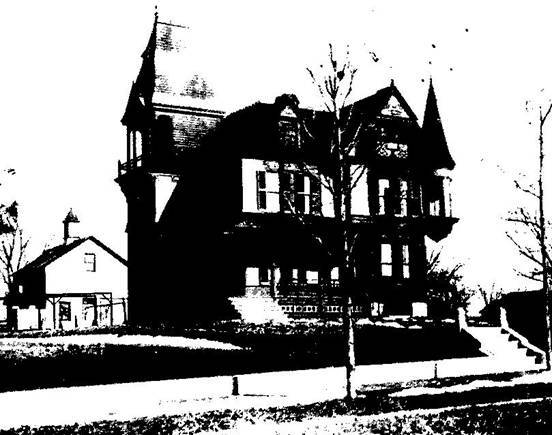 The house the he wanted was finished in 1886 by Page & Pinkerton hardware. Ithamar bought this two story “twin-towered mansion,” located at 614 East Broadway, for $7500 when it was finished. (See Appendix 3) Just a year later, Ithamar was elected Mayor for a second term. This time he would serve from 1887 to 1889. Ithamar was the first mayor to realize that the city needed a modern water system. He bought the first artesian well for the city during his term. By the time of his death on March 1, 1896, Ithamar had become a much respected member of the community. When news of his death came, banks and several businesses closed in his honor. Ithamar had been sick for three months, and “his trouble was a complication of diseases, and the best medical skill could not save him.” The funeral was held on March 5, 1896, at his home, which was the usual custom during this time. He was buried in the local cemetery in the Pillsbury family plot. He left his estate to his three daughters and his wife. The Monmouth Courthouse has a very extensive file regarding Ithamar’s estate. The appraisal of small items such as bobsleds and cattle alone came to $5127.70. He owned acres of land outside of town as well as his house on Broadway which he left to his family which totaled about $50,000. He also had some $40,000 in cash. Even by today’s standards, that is a lot of money. Mayor Pillsbury lived a long and fruitful life, from being mayor to raising a family. He was a respected member of the Monmouth community, as well as very closely connected to family and friends. Jennifer Rivers wrote this biography for her historiography class at Monmouth College in the fall of 2005 for William Urban. Rev. Ithamar Pillsbury.” I would like to thank Richard Uddin and his wife, Jan, for the wonderful pictures in this Appendix. 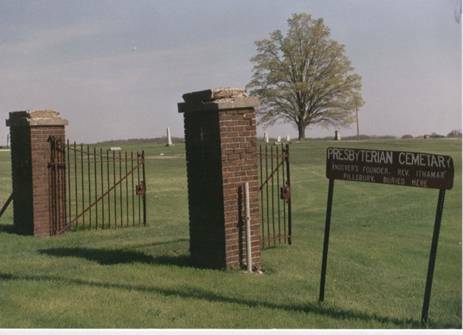 The Andover Cemetery, where Rev. Pillsbury is buried. Tombstones for the Reverend Ithamar in Andover Cemetery. The one on the left is the tombstone for his body and the one on the right is the memorial for his service in the war of 1812. This ad is from the Review Atlas newspaper in 1869, it seems that Ithamar owned his own business, but retired sometime in 1869 or sold it to become involved with the Pattee Plow Company. Ithamar’s house as it appeared during the time he and his family lived there. The house was re-sided in 1999 and turned into apartments. I have been told by many people that there was controversy around this work because many members of the town wanted to keep the house in its original condition. 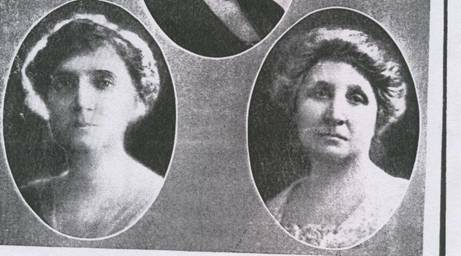 Georgie Pillsbury (Left) and Mabel Pillsbury (Right) from History of Kappa Kappa Gamma. I do not know when this picture was taken. 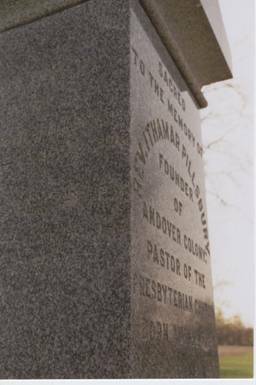 The Ithamar Family Plot is located in Monmouth Cemetery located on 6th street in Monmouth, IL. This is a picture of the large stone in the middle of the family plot. This is the inscription on the opposite side of the stone pictured above. 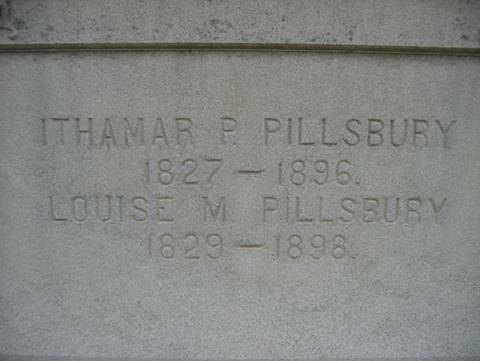 The headstone of Ithamar and his wife Louise M. Pillsbury. The headstone of the oldest daughter Alice along with her second husband Arthur Reesor. The headstones of the two youngest daughters, Mabel and Georgie. Pillsbury, David. The Pillsbury Family, nn, nd. Rankin, Jeff Ed. Born of the Prairie. Kellogg Printing Company, 1981. Robinson, Luther Ed. 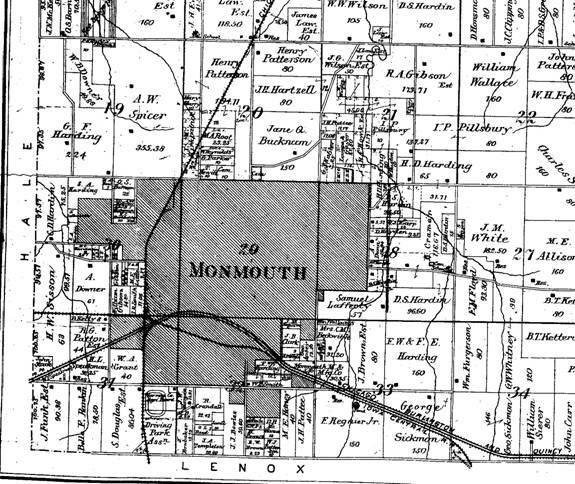 Historical and Biographical Record of Monmouth and Warren County Illinois. Chicago: Munsell Publishing Company, 1927. Sandstrom, Dean. Monmouth Historical Homes. 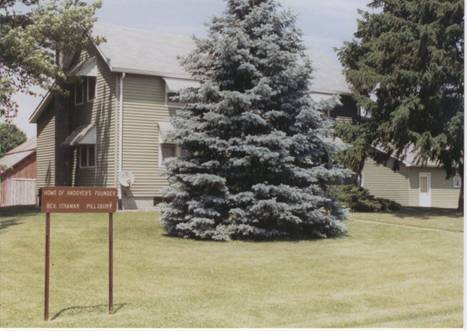 Monmouth: Warren County Illinois Genealogical Society, 1999. Daily Review Atlas, March 1-4 1896, Nov 30, Dec 2, 1898. Portrait and Biographical Album of Warren County Illinois. Chicago: Chapman Brothers, 1886. The Past and Present of Warren County, Illinois. Chicago: H.F. Kett & Co. 1877. From a portfolio of the Pillsbury family portfolio created by James Pillsbury Westerfield in 1940. James Pillsbury Westerfield got his information from The Pillsbury Family by David B. Pillsbury and Emily A. Gretchell, (np, nd). Obituary of Ithamar P. Pillsbury from the Daily Review Atlas, (March 2, 1896). Ithamar's other siblings are Almira (born Oct. 9, 1813), David R. (Feb. 24 1815), George B. (Oct. 4, 1816), Caleb (Feb. 26, 1818), Levi (March 22, 1821), Ithamar (Jan. 28, 1924), and Ester A. (Nov. 10 1832). Three of the siblings died while young. 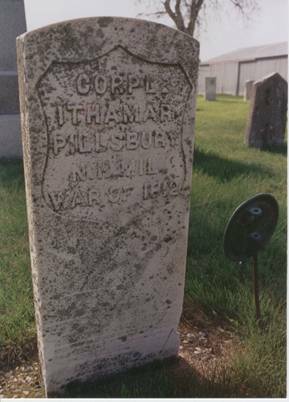 Obituary; there are extensive records of this Ithamar P. Pillsbury's land purchases in Henry County, and also census of his family. Canaan was her home town. (obituary), date from Pillsbury Family Lineage. Family Record courtesy of Richard Uddin. Family Record courtesy of Richard Uddin; the census of (August) 1870 lists Ithamar as 42, a hardware dealer, worth $4000 in real estates and $4000 in property, Louisa 40, Alice, 16, Mabel 13, Georgia 11, all children born in Illinois and attending school; the census of (June 6) 1880 lists him as 53, a cultivator manufacturer, Louisa, 51, Alice L, 24, housekeeper, Mabel G, 22 and a printer, Georgia, 19 and a housekeeper. Jeff Rankin, ed., Born of the Prairie (Monmouth, Kellogg Printing Company, 1981). Portrait and Biographical Album of Warren County, Illinois (Chicago: Chapman Brothers, 1886). Monmouth College Alumni Registry, 1929. Obituary Los Angeles Times (Jan. 17, 1947). Kay Larson, Kappa Kappa Gamma Fraternity. Kappakappagamma.com, Sept 2003. I have not found anything about them in alumni books or directories, but in the History of Kappa Kappa Gamma they are listed as members shortly after Alice. I have not found out what this means but the best explanation is that Ithamar turned it down. Robinson, Luther, Ed. Historical and Biographical Record of Monmouth and Warren County, Illinois (Chicago: Munsell Publishing Company, 1927). Historical and Biographical Record of Monmouth and Warren County, Illinois. Estate Records, Ithamar P. Pillsbury, 1896, Warren County Courthouse. Family Record Sheet for date of death and Monmouth Alumni Registry for her Residence. The alumni directory of 1929 has her already in Los Angeles.